Our Meetings are the 3rd Tuesday of each month at 7PM at the Talbot EOC/911 Center at 605 Port Street, Easton, Maryland 21601. Some of our members gather at the Olive Garden at 5:00 p.m. for dinner and fellowship prior to the meeting. Guests are always welcome. EARS is routinely involved with the activities around the Maryland Eastern Shore community. A weekly directed net on Tuesday evenings both provides practice in maintaining network communications procedures for emergency purposes as well as keeping members informed of activities of interest to the members. EARS also conducts Field Day activities to allow familiarization with emergency deployment necessities such as temporary antenna placement, off-grid power, and food and shelter provision. EARS regularly provides communications support to community activities such as marathons, bicycle races, and festivals. Those support activities allow use of mobile and fixed radio resources as well as practice in voice and digital message traffic passing. Members arrange monthly presentations and seminars on subjects such as earth-moon-earth communications, Amateur Packet Radio Service, and Echolink VOIP radio-internet communications. Show-and-tell is regularly exercised at monthly meetings so that members can introduce new equipment and services to others. The K3EMD repeater is operated and funded by the Easton Amateur Radio Society. The repeater itself is located south of Easton in Trappe, Maryland. The 340 foot tower site is on US Route 50 between Easton and Cambridge. Our repeater antenna is a Sinclair 4-Pole, low-intermod SD 214 mounted on a 6 foot ROHN bracket at 250 feet up the tower on the northwest side. We are using about 300 feet of 7/8" Andrew helix. The repeater itself is a Kenwood TKR-750K2 solid state, computer controlled repeater. The repeater and antenna system were purchased new during August 2002. We are using a late 1980's RC-85 controller. K3EMD Trustee: Mike Hollyday, N3OUE. 2 Meter CW practice every Tuesday at 7:30 PM with Tony, K1VUV, 147.045+ 156.7. 2 Meter Net every Tuesday at 8:00 PM on repeater with Peter KB3PGU, 147.045+ 156.7. 2 Meter Net on at 9:30 PM on Saturday night with Ray, W3BFC, 144.205 MHz USB. 6 Meter CW get together at 8:00 PM+/- on most evenings except for Tuesday on 50.0985 CW. After the CW we go for a short time to 50.145 USB to make excuses for our poor CW. As for the CW, don't hesitate to come in and join us. If the speed is too great, we will gladly slow down to what ever speed you are comfortable with. Remember that we are very happy to have you there. 10 Meter get together every evening at about 8:00 PM and later on 28.420 Mhz. USB. If you don't hear anyone, call CQ. Someone is most likely monitoring and will answer you. TECHS: We look forward to hearing you use your HF privileges! 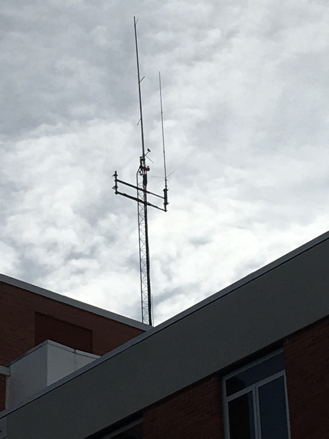 A new 70 cm repeater has been installed on a tower located at the Easton Hospital. Its transmit frequency is 442.200+ MHz with tone at 156.7. © 2019 K3EMD.com We do not collect or keep any information about you. All original content of this web site is copyrighted by K3EMD and is not to be used without permission except as provided herein.